Shirts With Random Triangles: Florida adds California four-star QB prospect Sheriron Jones to its 2015 recruiting class. 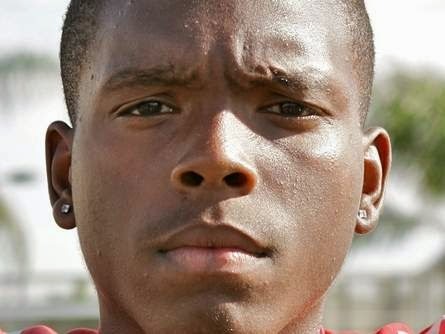 Florida adds California four-star QB prospect Sheriron Jones to its 2015 recruiting class. Sheriron Jones. Photo via The Gainesville Sun. Florida got the latest member of its 2015 recruiting class from the other side of the country. Moreno Valley, Ca. high school rising senior quarterback Sheriron Jones announced his commitment to Florida on Sunday following a his attendance at a camp on the Florida campus. Jones has been graded as a four-star dual threat QB by Rivals.com. The recruiting site is rates Jones as , as the 29th best prospect in California, the tenth-best dual-threat QB prospect in the U.S., and the 243rd best overall prospect in the U.S.
Jones attends Rancho Verde High School in Moreno Valley, Ca. He stands 6'2", and weighs 189 lbs.